We participated in a woman's health forum "Accidental Sisterhood" in Trinity, FL this week. Dr. Raymond Bologna presented his book "The Accidental Sisterhood". Dr. Parveen Vahora,MD ( Women to Women, PA) is a Laparoscopic Gynecological Surgeon and was one of the premier speakers. 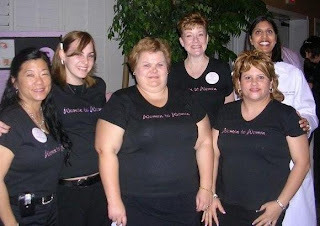 We worked with Dr. Vahora prior to the event and designed black T-shirts sporting the company logo "Women to Women" in pale lavender Swarovski crystals. They were a big hit and the women looked fabulous in their matching bling shirts! Great way to promote your business! It was a fun day of networking, education and meeting lots of great women!